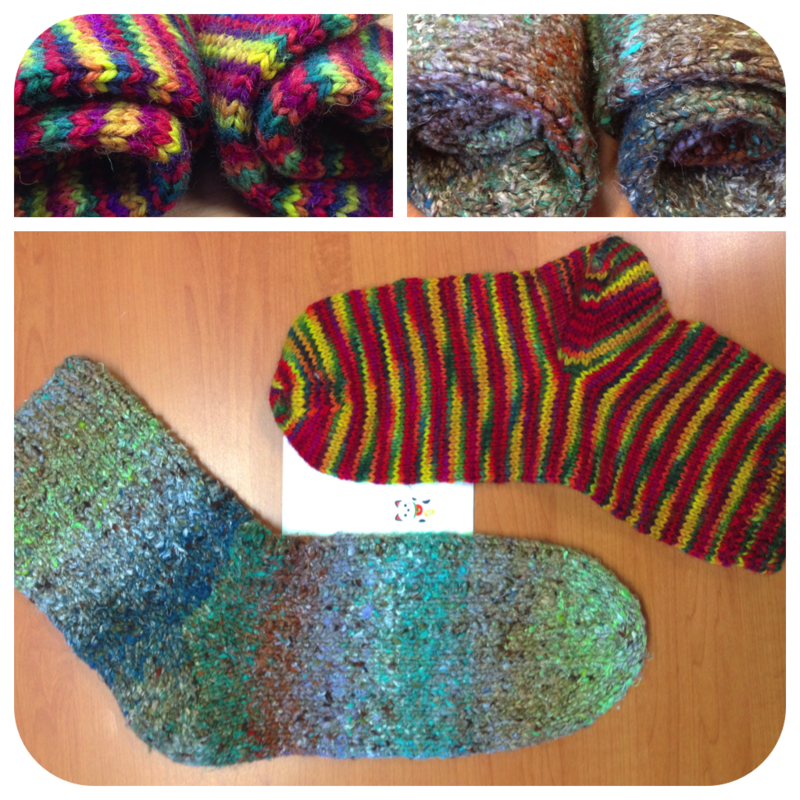 Knit-Worthiness – or – Bedsocks For Buddies! Within knitting circles, there’s a term you might hear thrown about: knit-worthy. Something I’m sure all crafters can relate to is the outside, non-crafty world not always understanding or appreciating just how much time, effort and thoughtfulness goes into the handmade treasures we make. Regardless of your skill or talent, if you sat down and made something, the product of that has an intrinsic joy and sincerity that store-bought things just don’t have. When a knitter refers to someone as being “knit-worthy” they’re essentially saying that this person gets it. Y’know? If you knit something for this person, they’d understand that you haven’t just given them a garment but rather you’ve taken your time, your thought, your love and the skills and knowledge you’ve accumulated since you first picked up a pair of needles (or hook, or loom, or paintbrush, or glue gun) and you’ve wrapped all this up in a little parcel just for them, and that this is a special bond between friends. Because, sadly, not everyone – no matter how much you love them or they love you – is knit-worthy. Well, I’m super lucky because I have lots of knit-worthy people in my life. Some of them are by my side every day, like The Beard. Some of them I get to see every week, like my knitting friends. And some of them I don’t get to see very often at all, like my bestie Panda, or my dear friends Robert and Alfio. Robert and Alf are those special kinds of friends that you can not see for ages and ages, and then when you do, rather than having grown further apart, it’s all the more exciting to see them. And, because they’re such lovely, decent humans, and because Alf asked ever so nicely, I knit them a pair of bed socks each, and I just managed to scrape them in for winter. They took a bunch of pictures for me too, so all the credit for these snaps go to them. Enough of the mooshy stuff and down to bidniss! Here are Alf’s socks, which I’ve mentioned before on here. 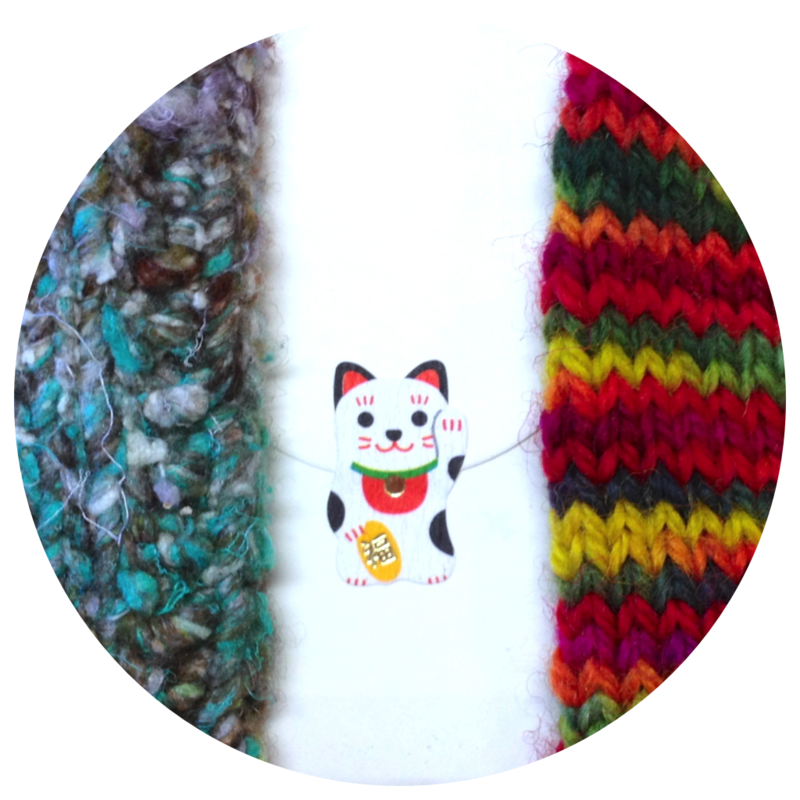 They’re made from Noro Kogarashi yarn which is rather luxurious. It’s 51% silk. Yumz. The pattern I used was Thuja by Bobby Ziegler which you can get for free from Knitty.com here. I really enjoyed the pattern. The combination of the yarn and the pattern soften the impact of the moss-stitch rib, but it gives enough interest while letting those lovely colors and squishy wispy bits take the spotlight. I was very pleased. 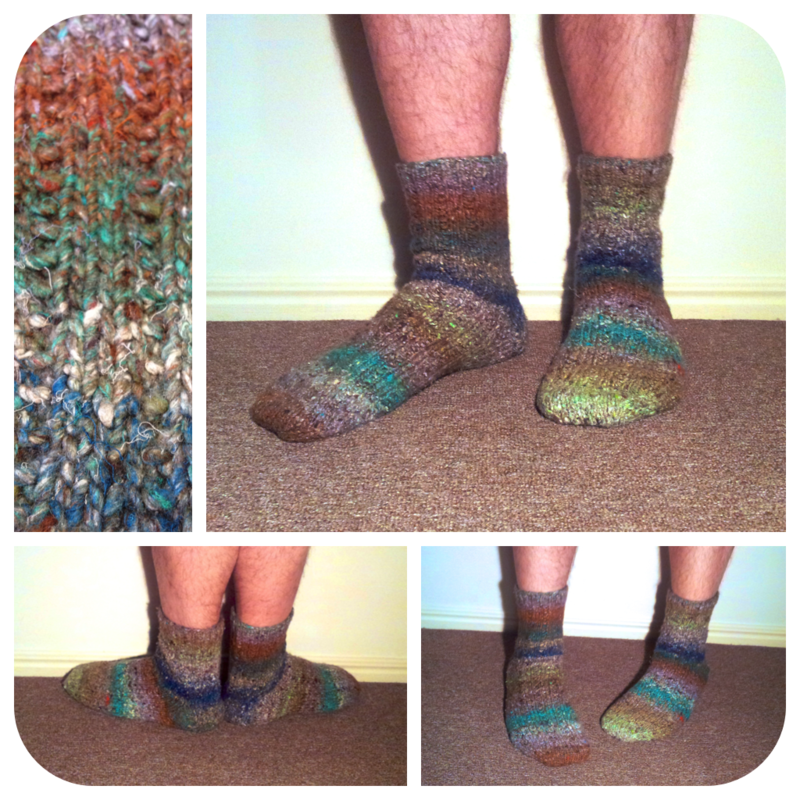 For Robert’s sock, I used Creative Fibers Hand Dyed yarn which is DIVINE. I loved it so much. You get it in a giant yummy hank and it smells delicious, though I’m not sure if that was the fiber or the dyes. The colors have to be seen in person because it’s nearly impossible to get an accurate idea of the colors from photographs. For the pattern, I took a risk and just made it up. I wanted to try doing an afterthought heel, and I think it turned out pretty neat. Robert and Alf seem pretty happy with their socks, and I think they were pretty excited to get a parcel in the mail. I mean, who doesn’t? I love getting parcels. I’ve said before that I’m not a huge fan of knitting socks and it was a long haul for me to finish both of these. Luckily, there were bed socks, so I got to use a heavier weight of yarn, but let me just tell you that Alf’s foot is massive and these socks felt like they were going to go on forever. But, I feel like I’ve reached a personal milestone now. I, Raynor the Shy Lion, can knit socks if I so choose. Heel flap or afterthought heels. Hurrah! But, most of all, I love thinking of my two dear friends having toasty warm feet in the colder months. And that makes me properly happy. Who are some of your favorite knit-worthy (or craft-worthy) peeps? Sharezies! I agree wholeheartedly with Lisa. Handmade gifts in the mail is absolutely one of life’s great pleasures. Also my best friend Kate who can’t knit or crochet but she does basic embroidery and loves anything crafty. Our Christmas gifts to each other are always hand made and so joyous. She made me a felt owl brooch last year and it’s one of my favourite things. It feels like it has a little bit of her soul in it. I love that. Ahhh yes – knit worthy! I so get this, I used to painstakingly make things for people only for them to brush off my handmade gift — arghhhhh I used to scream (in my head) until I then found those people who are Knit Worthy – so now I make them the presents and the ‘others’ just get a box of choccies! Knitting outside of my comfort zone has been extremely rewarding. 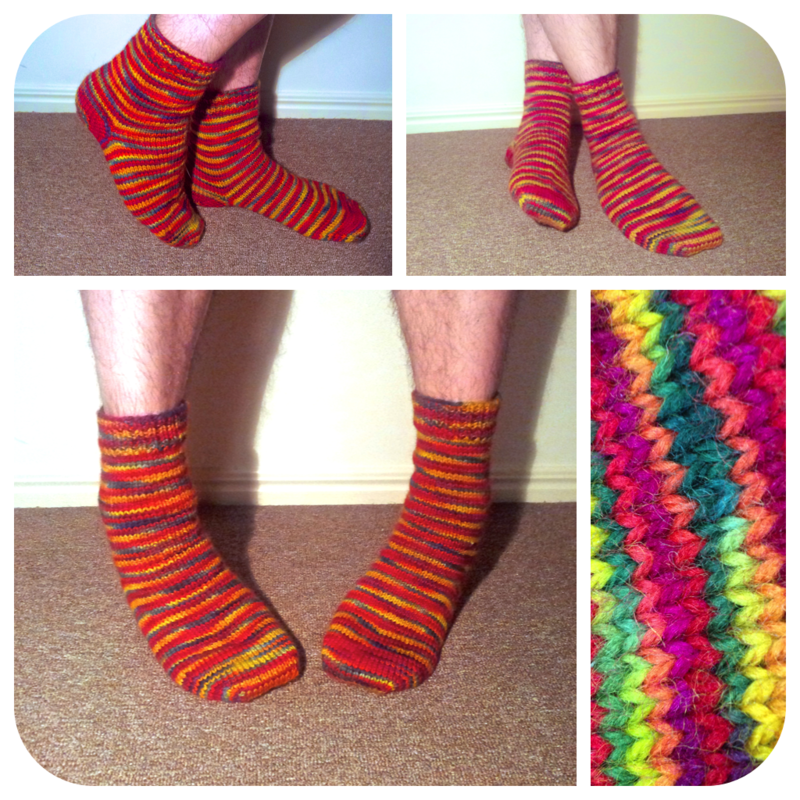 I didn’t think I could knit socks, let alone enjoy knitting them – especially on DPNs – but it turns out I really enjoy knitting socks! And the joy of knitting something for someone who appreciates it just takes it up to a whole other level. I’m a lonely knitter with few people to knit for, but so far I’ve found a few appreciative people in my little world to gift some projects to. I just hope they don’t mind being peppered with my knitted gifts. I knit something for someone a few months back and the person re-gifted it to someone else. I was a little heartbroken, but then I had to remind myself that I knit it for them because I wanted to. They didn’t ask me for it, and so I just had to be happy that the item hopefully went to someone who would enjoy it. Right now, I’m working on a triangular scarf (or shawl) that will be sent through the mail. The person has no idea, I’ve not even had contact with them in a few years, but as I knit I think about her and the surprise and hope that she loves the scarf. I think she’s totally knit-worthy. Knit-worthy is such a cool phrase. I don’t knit (yet!) but I do have friends I’ll now consider crochet-worthy or sew-worthy. My Mum is excellently crochet worthy – she’s a huge fan of my stuff – but I’ve also fallen foul of the ‘Is that all?’ gift receiver!